Need help choosing the right headset? 1. Do you want sound in one or both ears? Choosing a monaural headset gives you sound in one ear. This allows you to hear what is going on around you and stay in touch with your colleagues. However if you work in a noisy environment and need to concentrate on your call then choosing a binaural headset where sound is in both ears enables you to focus on your call better. 2. How noisy is your working environment? If you work in a busy or open plan office then a headset with a noise cancelling or ultra-noise cancelling microphone will eliminate virtually all background noise, which would otherwise be transmitted to your caller. This improves the call experience for you and the caller, eliminating needless repetition and safeguarding the confidentiality of the information exchanged.3. What device(s) do you want to connect to? Many people now want multiple connectivity to PC, laptop and mobile as well as to the traditional desk phone. Consider which devices you want to connect to today and potentially in the future to protect your investment. There are many options available. Talk to us to find your perfect headset solution. 4. What level of hearing protection do you need? Your headset alone does not provide complete acoustic protection. To guarantee this you will need an additional barrier device. Noise at work compliance may also be a consideration. If you want to find out more about acoustic safety, contact us and we will be happy to help. 5. Do you want a corded or a wireless headset? 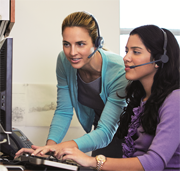 Corded headsets allow you to multi-task at your desk. However, if you want the freedom to move around the office whilst on a call, a wireless solution will allow you to communicate without being tied to your desk. If talk-time is an issue, or you are desk sharing, then choosing the appropriate wireless headset solution is important. Do ask us for advice. 6. Which wearing style do you prefer? In our experience the headband headset is the most popular headset style. However ‘over the ear’ and neckband headsets are available for those who prefer a headset to be more discreet. If you are considering this type of wearing style you should always look at other factors before you make your decision. For example, consider whether an ‘over the ear’ headset might cause discomfort over an extended period if you wear glasses. Some manufacturers offer a 3-in-1 convertible headset solution. For example the Jabra Biz 2400 allows a company to standardise on a single headset whilst letting their users choose which styling option they prefer. Specialist headsets are also available for the hearing and visually impaired. Speak to us for more information. 7. Where can you get the best advice and support? Ensure that you speak with an accredited partner. Partners have trained staff and the full support of the headset manufacturers whose products they offer. Look out for the accreditation logos. Speak with experts, buy from reputable sources. Have peace of mind. The rapid growth in the number of call centres and the increased use of headsets in today’s office environment is a major contributing factor to noise induced hearing loss and acoustic shock incidents. Contact centre agents of a major European Bank were experiencing acoustic shocks caused by sudden and unexpected loud noises/shrieks coming through the telephone network to their headsets. These incidents occurred intermittently across all the Bank’s contact centres over several months. 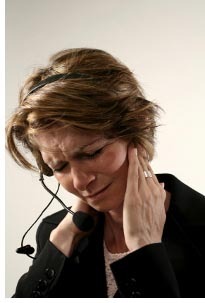 Contact centre agents experienced a range of symptoms from mild headache to severe nausea or neck and ear pain. The situation became so serious that the trade union threatened to stage a walk-out if the Bank’s management didn’t resolve the problem. After trialling all the global brand headset amplifier products that claimed to suppress acoustic shrieks with no success, their network provider recommended us as the European distributors of an Australian acoustic protection device called Soundshield. We installed a 16 seat trial at the most badly affected site. 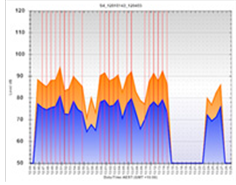 During testing, the Soundshield eliminated all unsafe acoustic shrieks and provided the Bank with sound exposure graphs to demonstrate the noise levels that staff were exposed to. The Bank was delighted with Soundshield’s performance and deployed Soundshield across all their contact centres nationwide. All acoustic shrieks and shocks have been eliminated, staff are protected and sound exposure records are kept. Acoustic safety is now guaranteed and staff, unions and management have complete confidence in the protection that Soundshield gives them. To read the complete case study click here. Soundshield 4G is a protective device which sits between your phone or PC and your headset. Its shriek rejection software rejects any loud or high pitched sounds to ensure that harmful noises never reach your ear, while delivering excellent voice quality and crystal-clear intelligibility. 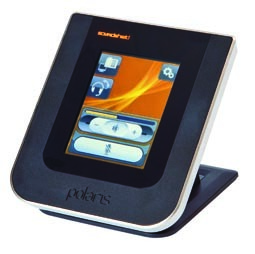 Polaris Soundshield 4G – peace of mind and protection for the employer and the employee. Read our Definitive Guide to Acoustic Safety. Noise at work – are you compliant? By law, employers must protect their staff against the harmful effects of noise. They must ensure that legal noise limits are not exceeded and reduce the risks of noise. Providing hearing protection, information, training and health checks are also legally required. Do you know what the legal noise limits are? Are you confident that you are compliant? The Noise at Work legislation says that employers must provide hearing protection to staff who are exposed to daily or weekly noise levels that average above 85 decibels. Though risk assessment must be undertaken where exposure levels average above 80 decibels. If you are concerned about whether you or your staff are safe from the risks of hearing damage or acoustic shock syndrome, contact us now to arrange a free audit. Call us now on 0118 920 9420 or email us at info@com-solutions.co.uk to arrange an audit or to discuss a trial or demonstration of equipment that will protect your staff’s hearing.